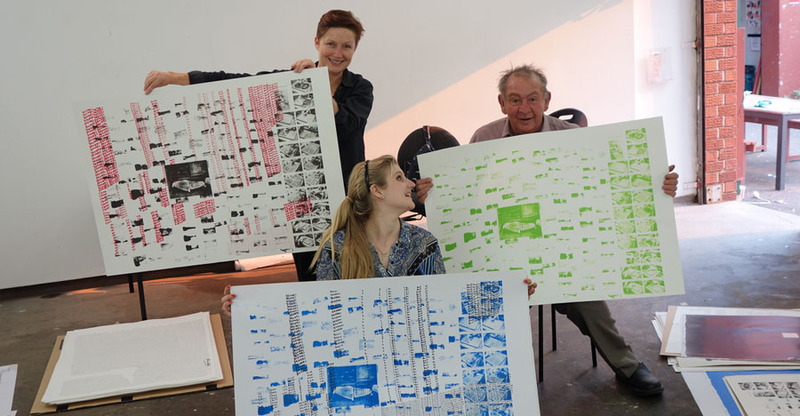 John Demos, Louise Anderson and Jo Holder making a curatorial selection for 2013 solo exhibition at The Cross Arts Projects. John Demos (with Louise Kate Anderson): “Philosophies”, audiovisual composition, Runway Magazine, 2015. John Demos with Lily Shapiro, Chris Murray and Daz Chandler, “The Count of Rook Woods“, short film, 2014. Josh Charles: “John Demos at the Big Fag Press”, video, 2013. Josh Charles: “John Demos at the Big Fag Press with Audio Captioning and Audio Described”, video, 2013. Josie Cavallaro and Kristina Tito, “The Outsider Mirage”, Runway Australian Experimental Art, 2015. Accessible Arts: “John Demos and the Amplify Your Arts Program”. Lucas Ihlein: “Finding a place in the art world: John Demos at Big Fag Press”, Realtime Magazine, Dec 2013-Jan 2014. Lucy Stranger: “Extrapolate: The Art of John Demos”, Artist Profile, 2015. Louise Kate Anderson, “Out with Outsider Art?”, Runway Experimental Art, 2013. Kristina Tito, “Calling All Robots”, Artwrite 51, 2013. Diego Bonetto: “On Acknowledging Good Art: John Demos”, September 4, 2015. Chloe Wolifson: “The Medium and the Message – A review of John Demos exhibition”, January 31, 2016. The Cross Arts Projects: “John Demos at the Big Fag Press”, 2013. John Demos: “John Demos Exhibition at Callan Park Gallery curated by Nerida Olson and Kristina Tito”, 2011. Hugh Nichols, John Demos Exhibition at Callan Park Gallery – catalogue essay, 2011. Louise Kate Anderson: “John Demos’ Accessible Arts Residency at Big Fag Press”, August 14, 2013. Louise Kate Anderson, “John Demos at Big Fag Press at The Cross Arts Projects”, 2013. Big Fag Press: “John Demos’ Accessible Arts Residency”, 2013.